Spring is one of the most exciting seasons when it comes to personal style. It means stripping off those heavy coats for the first time each year and bringing some life back into our wardrobes. As we move closer towards the peak of the season, I'm partnering with Banana Republic to share how I'm styling their spring collection for both day and night. With each new warm weather season, I challenge myself to incorporate more color into my wardrobe (and it is most certainly a challenge). 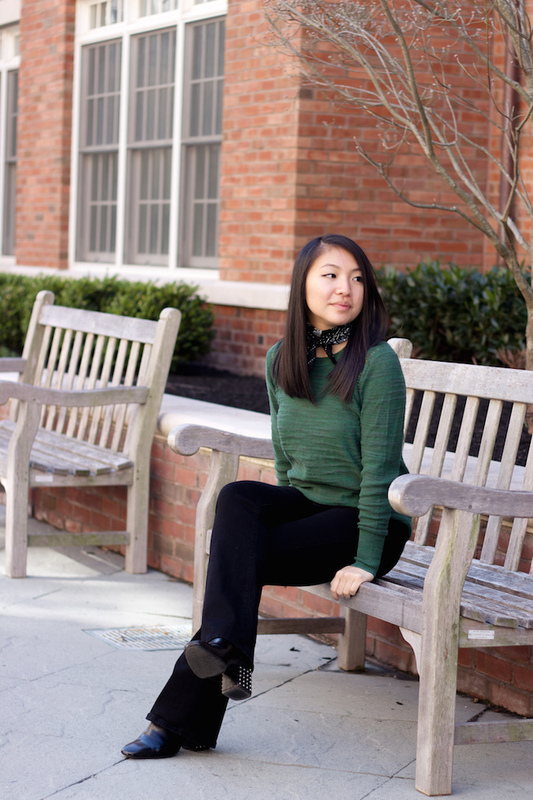 Green has never been my hue of choice, but I love how it has been toned down in this Heritage collection sweater. As a collection that is inspired by exploration with focus on details and fabrications, it resonates with my personal style and encourages me to break personal wardrobe traditions. 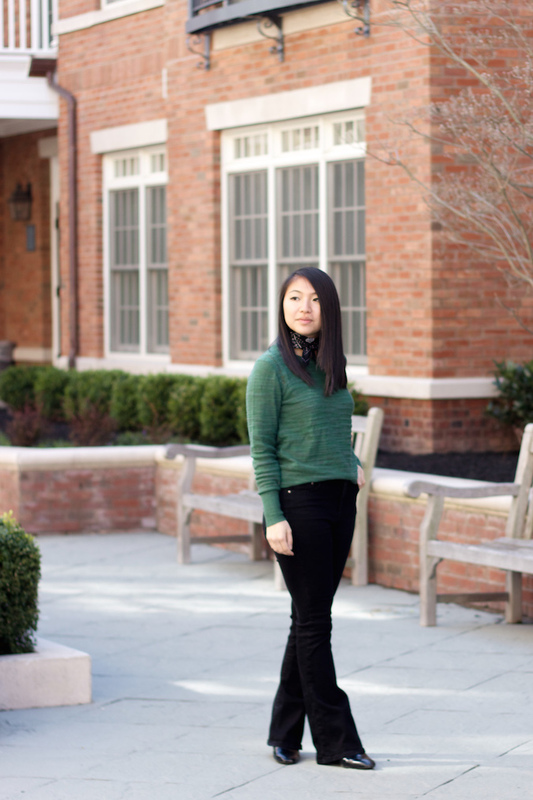 In styling this sweater for a casual day, I naturally paired it with entirely black pieces. 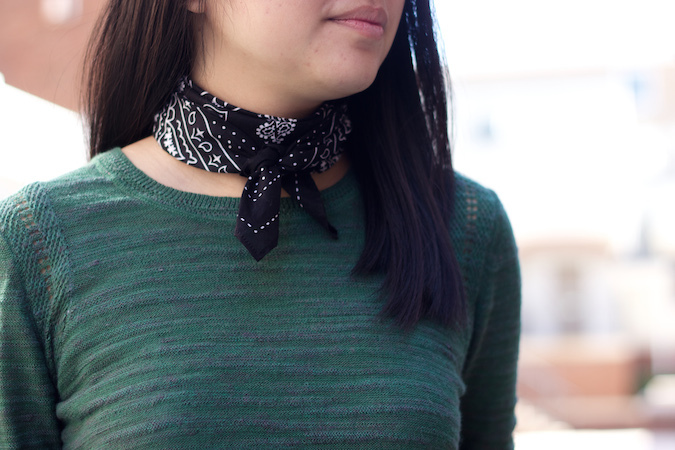 Flares have been my bottoms of choice when it comes to an easy statement, and the neck scarf adds another 70's touch overall. When it comes to evening attire, I prefer pieces that can also be converted for everyday use. I opted for these cotton chino shorts for their versatility. Their structure (and monochrome color, of course) allows for an outfit that can be taken straight from an afternoon shopping trip to happy hour. 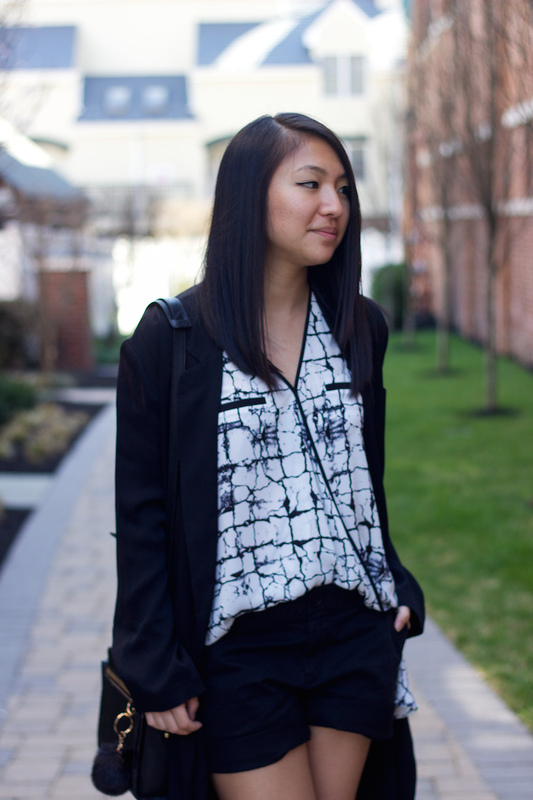 To finish off the evening look, I went with an airy, monochrome blouse and my heels of choice for the springtime. These heels have been in my closet for a while now, so naturally I was excited to find that mules have resurfaced strongly in this season's trend book. Let me know how you're upgrading your closet for the new season in the comments below. Happy Spring! Love how you styled the scarf! Gorgeous look. I love both of these looks, and I like how you did a day and a night outfit. They're both perfect for spring. I adore your green sweater and the marble top! Aw thanks so much! I'm surprised that I like this sweater as well haha. Definitely a different color for my wardrobe! both looks are amazing on you! loving both looks! you look so chic! Hello gorgeous! I also prefer to multi task and be low maintenance; I love pieces that can transition from day tonight. Loving both looks here, that black and white blouse is beautiful. I agree! It's always nice to have multi-use pieces haha. Thank you! the bandanna and the green sweater is really cute. I love both outfits. I really enjoy green on you, especially in that outfit combination. The bandana is a super cute touch! love the ootd. you styled it so well. I know you love your monochromatic outfits but you definitely look good in color too girl!! Love these looks! Aw, thank you Tina! You're too sweet! Cute simple outfit for spring. I love the daytime look so much. Ah you look fab, I love the neck scarf accessorising in the first look! you look stunning in each n every pic. Cute looks.